Giovanni Boccaccio (/boʊˈkɑːtʃiˌoʊ, -tʃoʊ, bə-/; Italian: [dʒoˈvanni bokˈkattʃo]; 1313 – 21 December 1375) was an Italian writer, poet, correspondent of Petrarch, and an important Renaissance humanist. 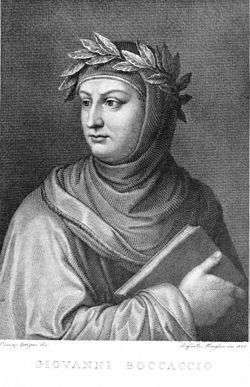 Boccaccio wrote a number of notable works, including The Decameron and On Famous Women. He wrote his imaginative literature mostly in the Italian vernacular, as well as other works in Latin, and is particularly noted for his realistic dialogue which differed from that of his contemporaries, medieval writers who usually followed formulaic models for character and plot. ↑ Giovanni Boccaccio; Mariangela Causa-Steindler; Thomas Mauch. The elegy of Lady Fiammetta. p. XI. ↑ James Patrick. Renaissance and Reformation. 1 2 Bartlett, Kenneth R. (1992). The Civilization of the Italian Renaissance. Toronto: D.C. Heath and Company. ISBN 0-669-20900-7 (Paperback). Page 43. ↑ Prudence Allen. The Concept of Woman: The Early Humanist Reformation, 1250-1500, Part 1, page 277. 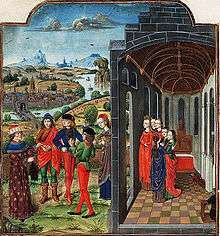 ↑ "Complete list of Boccaccio works at Decameron". Retrieved 5 October 2014. ↑ "Boccaccio, Giovanni ''La Fiammetta'' (1342), Project Gutenburg". Gutenberg.org. 2003-11-01. Retrieved 2010-02-17. ↑ "Boccaccio, Giovanni ''The Decameron'', Volume I, Project Gutenburg". Gutenberg.org. 2003-02-01. Retrieved 2010-02-17. ↑ "Boccaccio, Giovanni ''The Decameron'', Volume II, Project Gutenburg". Gutenberg.org. 2004-08-03. Retrieved 2010-02-17. ↑ "Encyclopedia of medieval literature – Boccaccio, Giovanni". Retrieved 4 December 2013. ↑ King, Margaret L. "The Renaissance in Europe". Laurence King Publishing, 2003, p.54. ↑ "The chronological archives of his complete works". Digilander.libero.it. Retrieved 2010-02-17. ↑ "Boccaccio's Archaeological Knowledge". JSTOR 498505. ↑ "Encyclopædia Britannica 2007, ''Petrarch and Boccaccio's mature years.''". Britannica.com. Retrieved 2010-02-17. ↑ "Library of Liberty". Oll.libertyfund.org. Retrieved 2010-02-17. Consoli, Joseph P. (1992) Giovanni Boccaccio: an Annotated Bibliography. New York: Garland. ISBN 0-8240-3147-4. Chisholm, Hugh, ed. (1911). 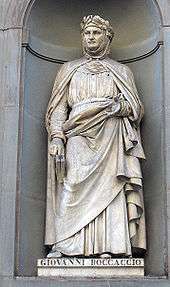 "Boccaccio, Giovanni". Encyclopædia Britannica (11th ed.). Cambridge University Press.